Before I became facilitator of Masterpiece Moms - a faith-based program for moms of kids with special needs at FBCG in Geneva, Ill. - the role was held by Masterpiece Moms co-creator Amy E. Mason. If you don't know Amy, lemme just tell you: She is lovely. Inside and out. She has the most peaceful, sunny, patient and kind demeanor of anyone I can ever recall meeting. Every time I attended Masterpiece Moms as a guest, she welcomed me warmly and led the group in the most beautiful prayers. When I was asked to fill Amy's shoes, after she moved to the West Coast, I was SO NERVOUS. Amy made leading Masterpiece Moms look effortless. In fact, for her, it may have been! She has a tremendous gift for bringing people closer to the Lord. So even though it was a COMPLETE surprise when I recently learned that Amy - so modest of her own accomplishments - is actually a well-known Christian author, it shouldn't have been. Amy's books, which collectively have sold more than one million copies, include God's Daily Promises for Women, 365 Pocket Prayers for Women and TouchPoints for Women. 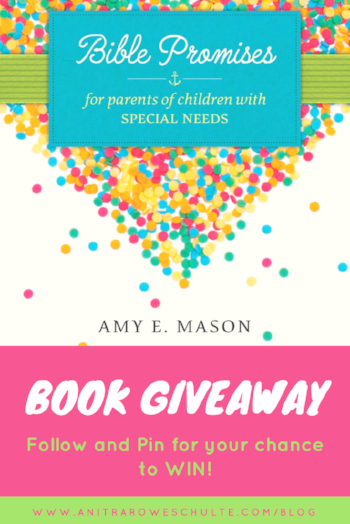 Amy's latest book, Bible Promises for Parents of Children with Special Needs, was released on APRIL 1 (Tyndale). I have a copy, and it has already been a tremendous blessing! When my son was first diagnosed with autism, I was desperate for hope. My schedule quickly became packed with therapy and doctor’s appointments, and I was exhausted and craving answers. I didn’t have the time to sit and do a Bible study, and I didn’t have the time or patience in that season to read a whole chapter book. I was longing for something that would meet my need in a moment, to help me find hope in the times when I was overwhelmed. I had trouble finding a resource that blended the truth of my parenting journey with my faith in God, and was accessible for a busy, stressed mama like me! Since I had written other Bible Promise books in the past, I decided I wanted to write one for other parents like me who were walking a little bit of a different parenting journey. I wanted a place where we could go to find the hope of Christ in any given moment, to give us the encouragement and strength to keep going with joy and courage through the challenges of special needs parenting. It took me three whole years to finally complete! How did you choose the book's 132 topics? Choosing the topics was a long process. I drew from my own experience and the experiences of other friends who also have children with special needs. I wanted the topics to be relevant for parents who have children of all abilities but also be very tailored to the unique emotions and situations we go through as special needs parents. Is there scripture (or a topic highlighted within the book) that you lean on with frequency? One of my favorite topics in the book is NORMAL. It seems like our culture can be obsessed with what’s normal, especially when it comes to child development. Since my son is very high functioning, I find myself always reaching for a sense of normalcy, and just when it feels within my grasp, his needs surge and it reminds me, we’re not your typical family! But in this topic, I explore the idea that God never meant for us to be like everyone else. God’s people were always meant to be different, to have different abilities and to be set apart. Most of us are very aware of how our kids our different, but maybe this is a blessing to never have to wrestle with the illusion of normalcy. If God calls us to be set apart, he will also equip us and our children to walk a different journey than those around us. I love that our God wants us to be set apart because it gives so much purpose and meaning to being different and helps me embrace my not-so-typical parenting journey! I want to encourage my son to shine in the body and with the abilities that God has given him. I want him to know that he is a blessing and a person of great worth in this world and in the church. The fact that he sometimes stands out is the stage in his life for God’s glory to be seen. CLICK on the Pin below. PIN it. FOLLOW Anitra Schulte on Pinterest. Easy peasy! Contest runs 4/19/17 to 4/26/17.